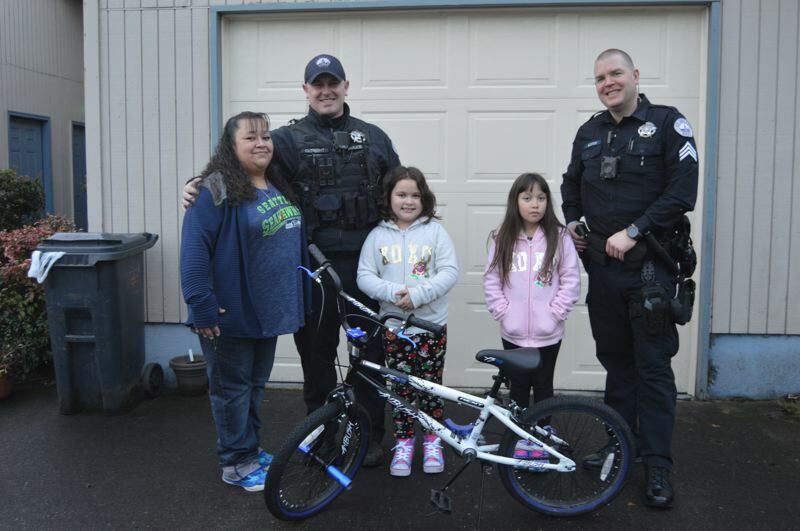 Two St. Helens police officers are being recognized for going above and beyond the call of duty after donating a bicycle to a local teen late last year — a gesture the teen's mom calls her family's very own "Christmas miracle." In December, SHPD officers Bryan Cutright and Evin Eustice were dispatched to a call where 14-year-old Sebastian Simpkins was dealing with a mental health issue and had been arguing with his mother. Simpkins' mom, Linda Banuelos, called law enforcement to help de-escalate the situation. When officers arrived, Sebastian, who is now a freshman in high school, recognized Cutright as a football coach and the two began talking. Cutright learned that Simpkins normally rode a bike he borrowed from a friend as a way to decompress, reduce anxiety and cool off during arguments. The bike had been stolen, however, leaving Simpkins without an outlet for his stress. The next day, SHPD officers called out a crisis intervention coordinator to talk with the family about counseling options and made plans to check in with the family. But after leaving the house, Cutright said something still didn't feel right. He and Eustice talked and decided to do what they thought was best — buy a bicycle for Sebastian. "When I left that day, I felt like he didn't have any valid options to cool off," Cutright explained. "So, I went to Walmart to buy the bike and Evin said if I bought the bike, [he] would pay for half." Banuelos explained how much the donation meant to not only her son, but the whole family. "I'm just still kind of in shock, and I think Sebastian might be too. We had a lot happen in a short amount of time," she explained, noting that her younger daughter had a birthday in early December, followed shortly afterward by a death in the family. The donation exceeded what Banuelos expected. She said it has also made a big difference in Simpkins' life. "It's his outlet, it's his independence. He gets to go explore, or help mom and get a gallon of milk at the store, you know? He loves it. He was able to go to his friend's house and go to the skate park," Banuelos said. "For him to be able to have that and have a brand new bike, he's really happy." The donation came to the family just before the holidays, which Banuelos said made it even more special. "It was beautiful. That night was just so beautiful and magical to see how my community pulled through," Banuelos said. "It definitely turned out to be the best Christmas miracle." For Cutright, buying the bike for Sebastian just seemed like the right thing to do. "I didn't feel like I had done everything I could. Part of the job is to make sure were not going to have issues again," Cutright said. "I just felt like anybody at the department in the same circumstances would do the same thing. I just happened to be the one that responded to the call." Police Chief Brian Greenway wanted to recognize the officers for their work. "Without seeking recognition or favor, both officers devised a plan to purchase the teen a new bicycle using their own money in order to help the teen out and make his life better," Greenway stated in an email. "I am recognizing both officers internally with a commendable action letter as well. Action like this not only demonstrate the epitome of community policing but defines their characters as a human being."